The Greatest Nightmare About to Unfold! Proof They are Pacifying the Public to Martial Law and Civil Unrest! While America may not yet feel like we are living in the middle of a battlefield, we could very well become caught in the coming battle many are projecting for the the near future…at least that is what the Department of Defense wants citizens to believe. Considering the United States government has been significantly increasing their training preparations with massive military drills like Jade Helm and the stockpiling of ammo, guns, body armor and the like. The possibility of some type of crisis or the declaration of martial law could become a reality a lot sooner than I would like to believe. An additional concern is the pacification of society to militarized vehicles. 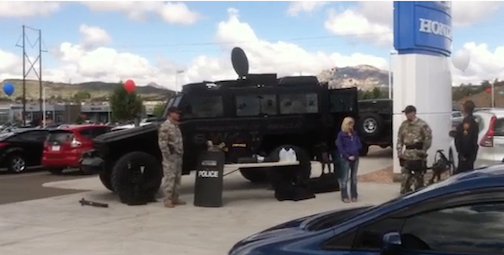 Just a few days ago a tipster sent me a video clip displaying the local police department dressed in SWAT gear with MRAPS, gas masks and riot gear at a Child Safety Event! The Unconventional Operational Concept and the Homeland Report was prepared as part of the Defense Science Board 2007 Summer Study on Challenges to Military Operations in Support of National Interests. It delves into the possibility of a catastrophe or crisis here at home while our military is deployed abroad at war or some other military issue. If that happens then the DOD will be called upon to act here in America. This document ensures preparations for that. Assuring Deployment and Supply: Three areas seemed most important for DOD attention: (1) critical infrastructure protection and/or resiliency, (2) logistics, and (3) family and individual preparedness. A fourth area, military installation protection and preparedness, was the subject of a recent DSB task force. “Possibly the most neglected member of the homeland security/defense team is the private sector. The private sector owns most of the infrastructure and will be the most effective in protecting (given timely and adequate threat information) and restoring its function after an attack. As such, it must be an integral member of the team alongside government actors in federal planning and information-sharing activities. 3. National Will hard to focus- Public anger manifested through misguided, vigilante-style attacks. 4. Impaired ability of national, state, and local gov to govern- lack of, or confusing, communications, fractured local authority, insufficient, disorganized emergency response. Without adequate preparedness at all levels of government, across the private sector, and among the populace, the post-attack results could indeed become catastrophic. – Flight. Remaining in place would prove untenable for many people for actual or perceived reasons. – Breakdown of mutual aid agreements. Resource-intensive incidents are typically handled through mutual aid agreements within the National Guard, first responder, and medical communities. When under attack, however, leaders in unaffected regions might opt not to support interregional common aid agreements and to conserve their resources in case they are needed locally. – Breakdown of civil order. Looting, vigilante actions, gang violence, riots, and civil disobedience would further stress first responders. – Failure of quarantine. Many will be reluctant to stay confined. – Hoarding. People will rush to amass excess goods to stock up after the attack. – “Shoot your neighbor.” As people perceive the social and civil situation deteriorating, they will escalate the force they use as a first resort to protect home and family from interlopers (“shoot first, ask questions later”). – Rampant rumors. Media will promulgate messages from many sources without confirmation. – Population center “meltdowns.” Many U.S. population centers are located where life without infrastructure services will be difficult to sustain, such as in the desert southwest in summer and northern cities in winter. The Posse Comitatus Act is typically viewed as a restriction on DOD engagement since it punishes those who “…except in cases and under circumstances expressly authorized by the Constitution or Act of Congress, willfully use any part of the Army or Air Force as a posse comitatus or otherwise to execute the laws….” A statutory exception to posse comitatus allows the President or other key government officials special authorizations for engaging the military in domestic situations. That authority has been exercised sparingly; examples include granting the U.S. Coast Guard law enforcement authorities and allowing the military to share information and equipment with civilian law enforcement, while prohibiting its ability to make arrests or conduct searches and seizures. For purposes of this discussion, the study assumed a multi-point attack on the United States that is severe enough for the President to declare the nation “under attack,” with federal authorities in overall control. Under such conditions, national resources will be stretched to the point where demands for national and international requests will go unmet. Local resources will also be overwhelmed and could face societal panic, if people feel localities are unable to provide law and order, medical care, municipal services (water, refuse), food, energy, trade, transportation, information system availability, and protection from the elements. Under such a scenario, two critical warfighting requirements occur simultaneously: defending against domestic catastrophe and ensuring deployment and supply. Domestic catastrophes occur in an environment of a large, undisciplined population, and these violent attacks can have a destabilizing effect on society. On the other hand, military deployment and supply take place in a disciplined organization, trained to accomplish the mission. Yet the two are linked—military deployment and supply is critically dependent on infrastructure elements that may be destroyed or severely compromised in a domestic catastrophe. Furthermore, both missions will draw on many of the same people and equipment, as discussed in the previous chapter. The protection challenge for the U.S infrastructure is significant, as illustrated in Table 5. “Americans have been conditioned over many decades to assume disaster relief assistance will come from communities adjacent to military installations and that other federal and state assets will be available. PreviousAbsurd! School Teaches Children There is No Such Thing as Male and Female! We are Living in the Last Days! 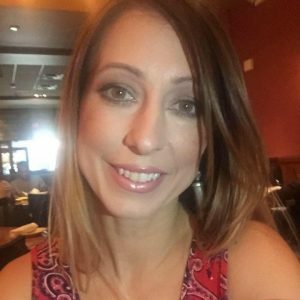 NextAlex Jones: “Something Big Is About To Happen!” Don’t Miss This Critical Alert! HUGE! The Intercept Just Leaked Massive Documents on The FBI, You Won’t Believe What They Found! its all documented in a nice pretty package complete with the pink bow to tie us up with!!! God bless America!! Lisa, This is the same Prescott Arizona that would not pay death benefits to widows of the Granite Mountain Hotshots that were killed on the Yarnell Hill Fire!!!!! 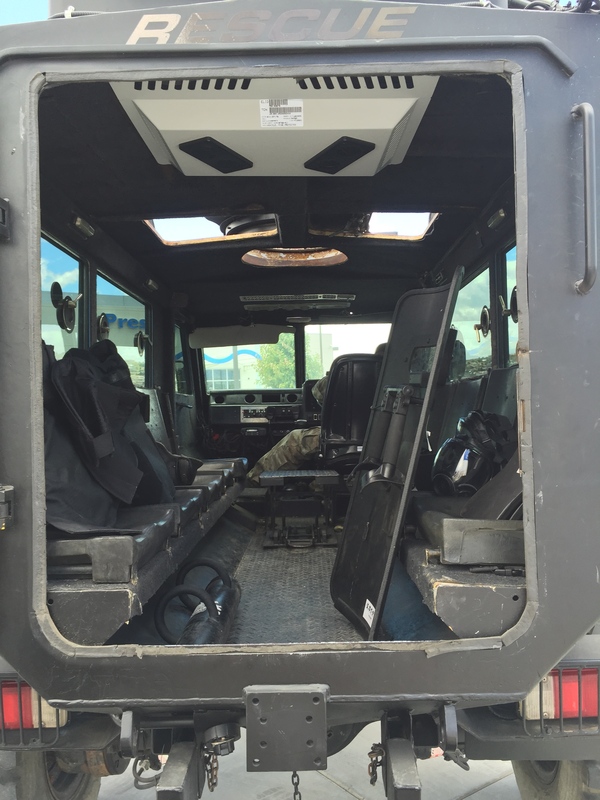 I approached OATHKEEPERS on Jade Helm, and their response was “Its probably to protect us from ISIS”?!? Can you imagine the stupidity? Unless they are a govt controlled ‘patriot’ group from the get go- which is what I’ve always suspected. Some of the biggest foes we face- are fellow Xtians- who Bill Cooper long ago revealed as having many MASONS among their top ‘patriots’. People like Alex Jones, Dave Hodges, Haggman “I Stand With Israel”, apostate John Haggee, Hawk and Quayle etc are at the heart of this deception operation. They never reveal false Israel, rarely quote NEW Testament or Christ’s word and theology. They are Zionists and not Xtians. Where do you stand Lisa? I notice your “bible” studies. How much do you really know of the Rothschild State? No Lisa, 911 was NOT implemented to imprison America. They already had that locked up. It was for ISRAEL to takeover the last noncompliant region of the world who resisted AntiChrist Israel’s rule over the world. NYT of Oct 9, 1940 announced “NWO is pledged to Israel” Before there was a state. NWO doesn’t have long to act. Time, which used to be on their side- is not any longer. But false Xtians will pit real xtians vs Zionists and ensure we all go down together. Wake up and read Hosea 4:6, Rev 2:9, Rev 3:9.
don’t just cherry pick what serves you. Explain the above. I think most people realize by now,I DON’T LIKE EVIL PEOPLE,so needless to say, I don’t like ANY AGENT OF THE GOVERNMENT,and no I was Never brainwashed to believe there were good ones and bad ones,THATS NOT WHAT OUR FATHER SAYS,and thats good enough for me,I stand with him 100%,HE says their all ROTTEN to the core,I’ll go with him,HE ALSO SAYS “I WANT MY NAME OFF YOUR MONEY NOW”of course the Gooood people in america will not listen,they’ll just keep doing the evil they do and FACE the FATHER IN HIS WRATH……..
Now, you are on the right track! The entire scenario unfolding is designed to target those who understand the depth of iniquity that this nation is involved in, and terminate them! Isn’t it a bit odd that those who stand up for the Constitution don’t understand that it was created by the Freemason’s of the Illuminati, who in the higher degrees worship and serve Lucifer, and that its origin goes way back to before the nation of America was created? Oh I believe it!! And have read many! God is speaking to his people. Prepare physically and spiritually for what is coming. Repent of all sin and stay close to God through faith in Jesus Christ. Stand strong in your faith in Jesus and be prepared to fight for and defend the constitution, the Bill of Rights, and the Declaration of Independence. The usurped Federal government who is aligned with the will of the NWO wants to take all of these away from us. For what its worth, just saw an MRAP being transported on a flatbed heading east on Hwy 50 through South Lake Tahoe. Time was approx. 10:50am PST. Had the word “Police” written on the side in dark green letters. Also had an LRAD on top. Was at a recent high school graduating ceremony. At this ceremony not one person thanked God. They thanked their teachers, administrators, and family, but not God. Jesus Christ was not mentioned one time. Says it all.